Crap! I done goofed. You know how when Netflix doesn't have the next movie in your queue available, they skip it and send you the next one after that? Re-Animator was next in my queue, but I wasn't paying attention. Netflix shuffled me around, but all I noticed was that there were two DVDs sitting by my TV, waiting to be watched. Unfortunately, they're both part of my next block (Evil Twins & Children). Here's why this is even more of a problem, though - my buddy Scott was going to guest blog Re-Animator with me. Fortunately, I am trained for just this type of situation. One of the things I do for my employer is business continuity planning and testing. If this doesn't qualify as a calamitous event, what does? So, here's what we're doing: Scott already sent me his write-up of Re-Animator, so I'm going to include it as a bonus movie for today. 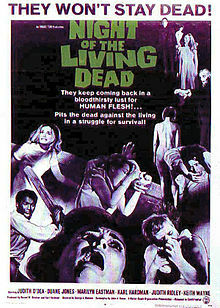 And I am going to pull one out of the collection, and watch Night of the Living Dead. I'm going to keep this a little shorter than usual, because I am flat-out exhausted from staying up so late every night. This isn't the most frightening movie around, although it has aged very well, and you can easily see how it was very disturbing and controversial at the time of its release. Zombie movies have become so focused on using extremely gruesome zombie makeup, and upping the number of kills, that it's fun to see the one that launched the whole phenomenon, low budget aesthetic and all. Just as many zombie movies have interesting commentaries on larger social issues, this one gives a compelling but completely subtextual look at race relations during the civil rights era. I watched this with Clay, who also joined me for Maniac a couple of weeks ago. He wanted to try another, so I took this to his house tonight. He told me that it was literally the second scary movie he'd ever seen, Maniac being the first, but that he hadn't been all that scared by it. I'm going to have to step up my game with Clay and bring something that will really scar him. Time to bring back Inside. We're two-thirds through Return of Project Horror! I'm kind of ready to be done. I'm really tired from all of the late nights this month. 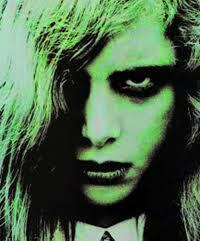 Night of the Living Dead: I can't argue with a classic. You get five zombie tweens out of five. What's really interesting to me about that is how it shows the sliding scale of acceptability over time. This movie was *controversial* when it came out, and now high school theater troupes perform it. I'd actually be interested to see how they do it, too. I have to admit, it's well-suited to the stage, since virtually all of the action is confined to one room.